Summer Dreamin' Blog Hop… and Give Away! Welcome to my day on my blog hop! I wanted to feature some fun summer projects using my new line from Moda called Sanibel so I invited a few of my friends to help me out. I hope you've had a chance to visit their blogs this week, seen some fun ideas and registered for give aways of precuts of this line. I'll list all of the stops at the end of this post just in case you haven't! This very colorful line of fabrics was inspired by this photo and a desire to draw vintage swimsuits. I love this photo. When I look at it I can feel the heat of the sun on my face... and the sand in my suit! Ha! The swimsuit art didn't make the cut, but there are other fun motifs in this line including sunglasses, hibiscus flowers, and a print reminiscent of vintage lawn chair webbing. I hope you find it happy and that it gives you some ideas for summer projects! Here is my project. Always short on time I wanted to pull together a quick idea that also showcased the prints in the line. 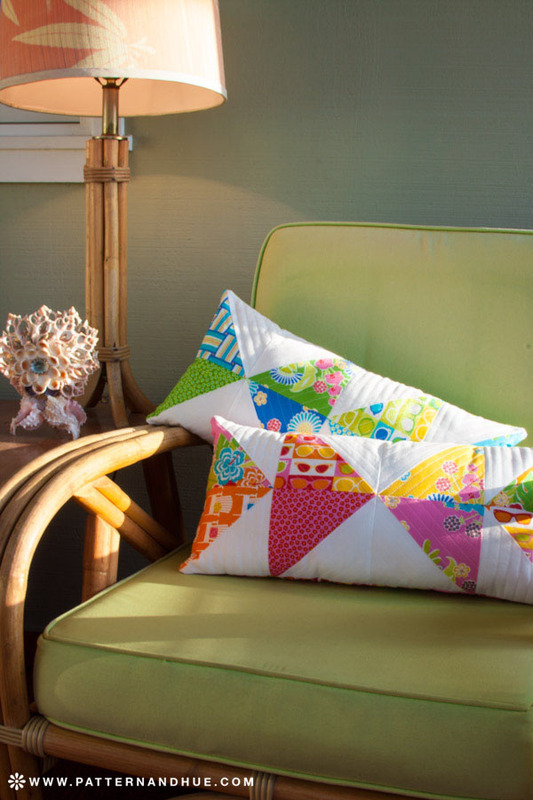 These 10"x 20" lumbar pillows are so easy and are sure to brighten up your porch. The "arrows" are made up of simple half square triangles. Not being able to decide which prints I wanted to use I just cut a whole bunch of 6"x 6" squares of the prints and the white and sewed them together. The pillow uses 8 blocks so you can use up to 8 different prints if you want…or coordinating solids. There are no rules! If you've never made a half square triangle block, the easy way is to draw a diagonal line from opposite corners on one of the layers of your block. 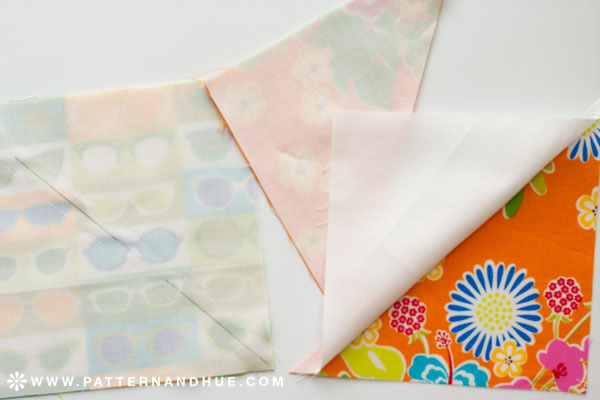 Sew a scant quarter inch seam on either side of the line. Chain piecing makes quick work of this. 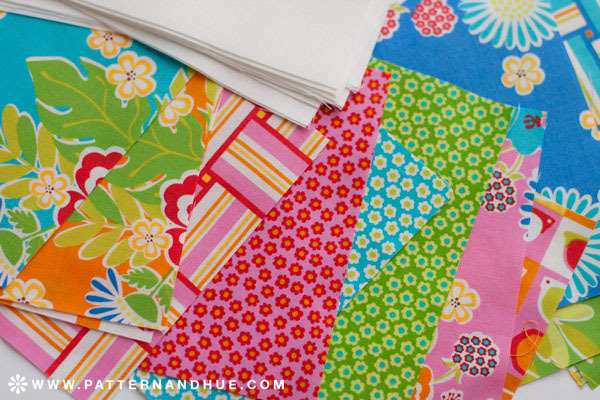 Once your blocks are sewn, cut them apart along the line you drew and press them open. Now square up and trim the blocks to 5½” x 5½” square. Next, I took all these HST's I made and played with arrangements on my design wall. I think keeping all the prints within one color family helps them hang together. Once you decide on an arrangement, sew the blocks together. It's helpful to alternate the way the seams are pressed so that they nest together and you get crisp points. Sometimes, once I was ready to sew, I had to take the block back to the iron to press it the opposite way. Not a big deal! Once all 8 of your blocks are sewn together you should have a panel that is 10½” x 20½”. Cut a panel of batting that is 2 inches larger all around and pin baste it to the pieced panel. At this time you may also want to cut a backing panel that is the same size as the front panel, cut a piece of batting for it and quilt it too. Quilt the panels in anyway you wish. Once the quilting on the front and back panels are complete, sew them together with right sides together and using a quarter inch seam allowance and leaving an 8" opening in the seam. Clip off a bit of the seam allowance at the corners and turn the pillow. Stuff with lots of batting and slip stitch the opening closed. Now you have some colorful accents for your porch or patio! Thanks to Moda's generosity, I'm very excited to give away a jelly roll of Sanibel to one lucky reader. Just leave me a comment and you'll be entered. I'll use a random number generator on Sunday night, the 12th, to pick a winner! As I mentioned before, there have been other stops on this blog tour this week and they are all offering precuts prizes as well. Pattern and Hue - That's me! Be sure to visit them and happy sewing!